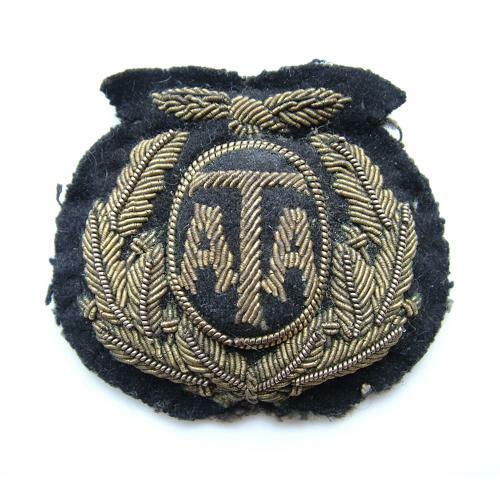 Air Transport Auxiliary cap badge manufactured in gold bullion thread on black felt. Lightly padded and backed in a coarsely woven black cotton. Light tarnishing but in excellent used condition. All A.T.A. inisgnia is scarce, difficult to source and highly desirable but this one actually belonged to Flight Engineer D.B. Hewitt who flew with the A.T.A. between 15.07.42 and 31.07.45. Among the aircraft he ferried (between Scampton & Woodford) were two of the Lancaster bombers (ED932 & ED912) used by 617 Squadron commanding officer Wing Commander Guy Gibson and Pilot Officer Les Knight on the famous Dam Buster raid. Stock code U23410.